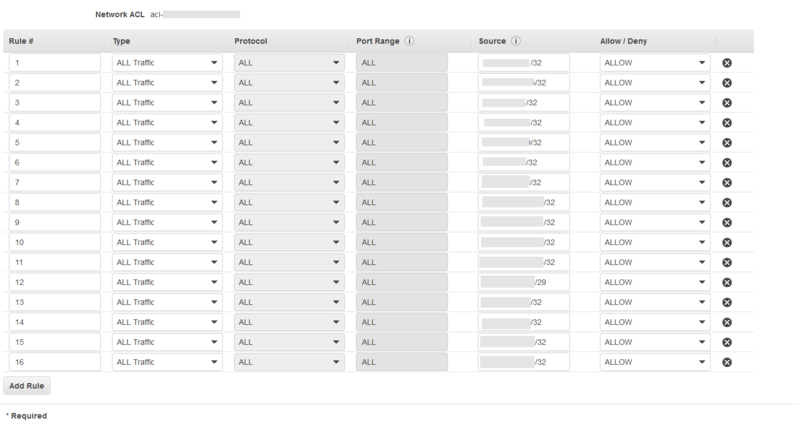 I have an amazon-ec2 instance, running Amazon Linux. Docker installed on that instance used to work just fine until I created a network ACL and applied it to the subnet, which my instance with Docker belongs to. The ACL contains restricts Inbound traffic to certain IP addresses and allows all Outbound traffic. I tried looking into a Flow Logs and saw some incoming requests with status REJECTED. I suspect, that "docker-pull" causes some incoming connections which are blocked by the ACL. And these connections are coming from different IP addresses, so I could not find any "fixed" set of IPs which I could add to the allowed list in ACL. Can anybody suggest the way to configure it properly and fix pulling docker images? Browse other questions tagged docker amazon-ec2 acl docker-pull or ask your own question. How to access internet from an EC2 instance running Amazon Linux that is in a VPC?